Comfortable, light and spacious gite. Well equipped. Easy access to main road but in a countryside location. Short level walk to Huelgoat with its huge lake and fascinating rock formations. The town boasts a variety of shops and restaurants and is a wonderful area for walking, cycling, horse riding, fishing and an excellent centre for touring. English owners on site. Gite is on ground floor with no steps. Comfortably furnished and well equipped. Please note the large flat screen satelite TV is English. Parking in our courtyard outside Gite entrance. There is an outside area with decking and garden furniture overlooking our land and the forest. Holidayed in the area for many years and found this property to be perfect for us being close to all amenities and the beautiful town of Huelgoat with so much to do yet set in the peaceful and beautiful countryside. Our Gite is entirely on level ground with parking outside the door in our private courtyard. Shower room with luxury multi-jet shower cabinet, basin and WC. Bath and hand towels. Kitchen towels. Olease bring your own beach towels if required. Outside: Outdoor seating area with garden furniture overlooking our own fields. Cleaning / Towels / Linen Towels and bedlinen provided. Bed made up for your arrival. Heating included. We do not make an additional charge for end of stay cleaning, therefore we ask that you leave the Gite in a clean and tidy condition as you will find it on arrival. A lovely welcome from the owner. 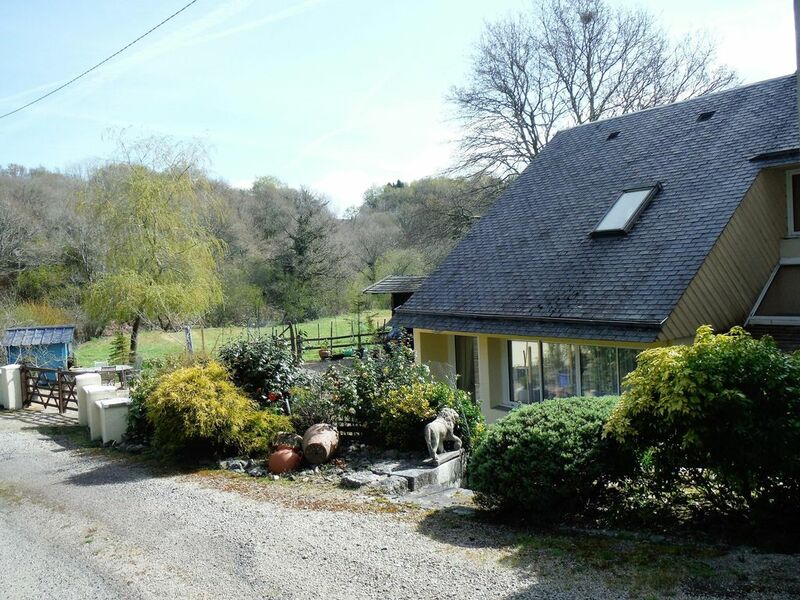 A spotless Gite in a lovely location, very well equipped and comfortable. The photos are very true of this property, its spacious and light, spotlessly clean & very quiet. Parking is off road and private with no steps into the property. Huelgoat is in a very central location in Brittany so there is alot to see and do within a short distance. The town has everything you need and more - the cycling and walking is excellent around here. You can walk into the town square from the Gite in 10 mins... Only problem which for us which was major is that the property is damp, that strong smelling rising damp - such a shame. There is a small electric fire which was enough in August and there is central heating but operated by the owner whom we hardly saw. This area is full of forests and is generally quite damp....but even when we aired the property as much as we could it was still very damp. Also time for a new bed....its not king sized in the world we live in and for two of us it was not comfortable. We are so pleased that you won't book again! When you arrived we explained that we are on site 24 hours a day as it is our permanent home. Therefore you would see us coming and going but if there was anything at all that you needed to come and ask us. This you failed to do. There is also an Information Book in the Gite which explains this but you clearly failed to read this as you left early on the day of departure without advising us as requested. The Gite is NOT damp! If you shower and do not open any windows you will encounter condensation. The heating, despite it being August, was on morning and evening in addition to the electric fire. However, as you live in a much hotter and drier climate, perhaps Brittany with its forests, lakes, rivers and greenery was a poor choice for you. As for your comment about the bed, many guests comment that it is very comfortable and IT IS King Size. The state in which you left the Gite was appalling, it was filthy with even saucepans returned to the cupboards unwashed and having asked for additional coat hangers, you chose to remove some of them on departure. Therefore, we are delighted that you wouldn't return as we wouldn't want you back. This is our second year staying in Huelgoat, a truly lovely market town with a nice central square populated with a number of welcoming bars. The little mill is a lovely location, I am 74 years old but managed the walk to the town with no trouble at all. The walk is level and the vast majority of it is off the road. The Gite itself is nice and comfortable and very quiet, it has the advantage of being all on one level. The owners live on site but left us to our own devices but were available for advice when needed. The property is well equipped, even having a dishwasher a real luxury when there are only two of you! We would certainly go again and have no hesitation in recommending it to you. We are so pleased that you enjoyed your stay in our Gite and found it well equipped and comfortable. Many of our guests enjoy the walk into the centre of Huelgoat, it is easy and much of it is alongside the beautiful lake. It was very nice to meet you both and we look forward to your next visit. I thought Cornwall had all the Arthurian history, but staying here and with the help of the owners guidance and excellent information I learnt France and Huelgoat also has a call on the legends. A wonderful gite, so perfectly equipped and spacious with surrounding open land made for a quiet and restful stay. The hosts happy to indulge our interest in their menagerie of ducks, hens and two entertaining goats were helpful in every aspect and even provide wifi if you cannot manage to enjoy the rest and need your connection with the real world to remain. We found it an ideal location to explore from with the town within a short walk along the riverside and no doubt in summer the opportunity to use the nearby swimming pool too. A stroll round the lake blew away the cobwebs of the working weeks and the granite boulder canyon great to explore. Many walks exist through the surrounding forest exist and are suitable for exploring on foot or bicycle if you have one to hand. There are lovely local shops in the town who tolerate the most broken of French and the market traders have a lovely range of fresh produce. If your French language skills are not strong a larger "Super U" supermarket can be found close by where self service make it easier to shop. The drive down from Roscoff is so easy that we arrived earlier than expected, so make sure you can factor that in to your trip. It is worth it as the owners had cleaned the property to a spotless level by the time we came back to book in properly after kindly being allowed to deposit the main of our luggage before heading off to pick up shopping. There are two gites to choose from here making it ideal if you have a larger family or group who want or need two separate rentals. The downstairs rental is all on one level and is easy access making it suitable if you lack mobility or just can't cope with stairs. The upstairs rental is just so cute with views across the countryside and is open planned giving it a lovely airy feel. Although we visited in the cooler time of year, March, the heating was enough to keep us warm and toasty. An excellent place to stay for relaxation, romance or just as a retreat from everyday life. Thank you very much for your kind comments. It was a pleasure having you to stay in our Gite and we are so pleased that you enjoyed all it has to offer, as well as the beautiful area in which we are located. Location très agréable,propre et fonctionnelle.La propriétaire des lieux est charmante et l'emplacement est idéal pour visiter la région. Merci pour votre avis, nous sommes très heureux que vous ayez apprécié votre séjour dans notre Gîte. C'était un plaisir de vous rencontrer et de vous remercier d'avoir laissé le Gîte si propre et rangé. Thank you for your review, we are very pleased that you enjoyed your stay in our Gite. It was a pleasure to meet you and thank you for leaving the Gite so clean and tidy. Coast and beaches 40 minutes drive. Swimming lake with beaches 15 minutes drive. Indoor swimming pool in Carhaix 12 miles away. Lots of walks in the nearby Forest. St Brieuc Airport, 55 miles. St Malo Port, 120 miles. Supermarkets, banks, post office and a variety of shops, restaurants, creperies, pizzeria and bars all within the town of Huelgoat. Booking Notes: A £100.00 deposit is required to secure your booking, the balance payable 6 weeks before arrival. Discount available on your ferry crossing with Brittany Ferries. Please ask for details. If you have to cancel your booking the following charges will apply:- Prior to 6 weeks deposit only. Within 6 weeks 100% unless we are able to re-sell the dates. Holiday insurance strongly recommended. Your security deposit will be returned with 2 weeks of the end of your stay subject to the property being left as found on arrival with no damage. We have a No Smoking policy. Changeover Day: Arrival time 4pm. Departure time 10am. Changeover days flexible. Notes on prices: Short Breaks and Special Offers subject to availability. Please enquire.